The Lauda Ecoline RE104 Recirculating Chiller is easy to use, with a powerful circulating pump, and precise temperature control. The pressure pump on this recirculation chiller has a vario drive, offering circulation inside or outside the bath, or divided flows. The pump can be used with viscosities up to 150 mm²/s, with 30 mm²/s being the optimum for performance. The Lauda Ecoline Recirculating Chiller uses hermetically sealed refrigeration system, with a fan cooled finned condenser that dissipates motor and condensation heat. 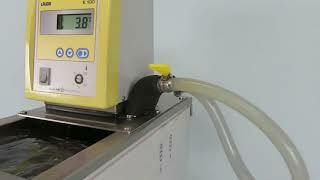 The Lauda Ecoline Recirculating Chiller thermostat can be navigated through a 7 segment LCD screen. As a safety feature, there is an automatic shut offs for both temperature and liquid level to prevent dry operation and pressure monitors to protect against excessive pressure. In the event of a power failure all error messages, and settings are stored in memory. This Lauda Ecoline RE104 Recirculating Chiller has been tested and performs as expected. All of our lab equipment comes backed with our standard warranty. Should you have any questions, please don't hesitate to contact us.